Explore a new frontier February 12-15 at the 2012 New York City Toy Fair booth #3011 where Monkeying Around will feature their famous connect-the-dot puzzles and a sneak peak of the new Greatest Dot-to-Dot Adventure series. "You did a brilliant job of bringing back the Dot-to-Dot, and made it a classic all over again. I'm seeing spots!" Toy enthusiasts from around the world are convening at the New York City Toy Fair February 12th-15th. Famous for their Greatest Dot-to-Dot series, Monkeying Around prepares to unveil their latest Adventure series with creative activities and challenging puzzles unlike anything puzzle lovers have ever seen, only at booth #3011 on the upper level. In addition to games and puzzles, toy lovers will also enjoy a sneak preview of the Greatest Dot-to-dot Adventure: Book 1. The next generation Dot-to-Dot puzzle book created by David Kalvitis is set for release in Spring 2012 and weaves all of the varied challenges and puzzle styles of its predecessors with a multi-layered mystery that includes new styles, hidden clues, an intriguing story line and larger landscapes. The adventure begins following a guide, an imaginative young boy searching for the missing pieces of a mysterious gift. Together, visitors will navigate challenging puzzles and unearth secret clues to discover new species of dots and spectacular views. One can even challenge themselves by scaling the "Everest of Connect-the-Dots", a puzzle comprised of a record breaking 2,800 dots. "You did a brilliant job of bringing back the Dot-to-Dot, and made it a classic all over again. I'm seeing spots!" says fellow award winning game designer and consultant, Peggy Brown. 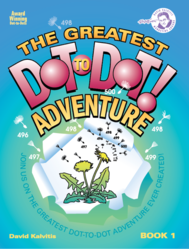 Toy Fair visitors can get their hands on a free Dot-to-Dot puzzle from the forthcoming Adventure Book as well as enter a drawing to win free books or a year of free shipping. Monkeying Around was founded in 2000 by David Kalvitis. Kalvitis is a lifelong puzzle and game fan, has a Fine Arts degree from Syracuse University and operated a graphic design business in Upstate NY for 13 years. Since 2000, Monkeying Around has been dedicated to offering innovative dot-to-dot products that will delight and entertain children and adults of all ages. Monkeying Around produces "The Greatest Dot-to-Dot Books in the World," a challenging collection of unique dot-to-dot surprises and variations. The company also publishes "The Greatest Newspaper Dot-to-Dot Puzzles," pocket and travel sized collections of weekly syndicated puzzles, in the pages of USA newspapers. In 2007, the first of the "Greatest Dot-to-Dot Super Challenge” Books was introduced.